Review recent and estimated tuition charges for BYU, as well as just how these prices contrast to nationwide and regional averages. Learn how fees and tuition at BYU measure up to other universities and colleges and see what you can do to effectively prepare for probable tuition growth. How do Tuition & Fees at BYU Compare With Other Colleges? For nationwide, regional and statewide comparisons, view the following table to find out how BYU compares to other colleges. How Much Does BYU Charge for Tuition? Full-time undergraduate students at Brigham Young University - Provo were charged $5,460 in tuition and fees in the 2017 - 2018 school year, prior to modifications for financial aid. Of that number, the price of tuition came to $5,460. Unfortunately, this college doesn't offer any reductions to residents of the state. The tuition and fee costs cited here don't include room and board, which can drive up your expenses. Having said that, a lot of students end up paying less than maximum tuition because they receive financial aid as well as other reductions. Discover BYU cost per credit hour here. 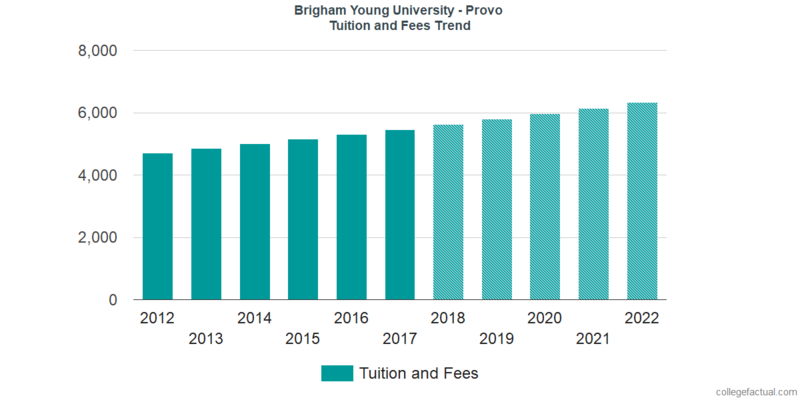 There continues to be a rise of 3.0% in Brigham Young University - Provo tuition and fees for out-of-state students in the past five years. Tuition grew by 3.0% and fees grew by 0.0%. This school year, undergrads can anticipate paying $5,624 based on current estimates. Because of price growth, the total expense of a four-year BYU degree would be $23,528, and the total price of a two-year degree would be $11,416, which doesn't include extra charges for books, transportation, and room and board. The subsequent chart reveals estimated future tuition and fees for undergraduates at BYU. Mainly due to the cost of living as well as other factors, the cost of college has a tendency to increase each year. For this reason your last year of school may very well be much more expensive than your first year. Get your financial college concerns clarified in our tuition & fees FAQ.